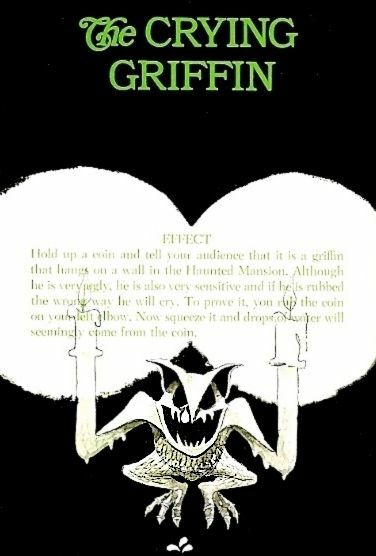 So begins the booklet accompanying the souvenir record album, "The Story and Song from the Haunted Mansion." As we've said in one way or another more than once, the gist of the attraction consists in presenting you with a mock choice. 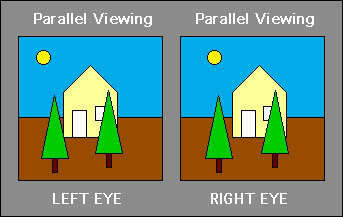 You see impossible things and you must decide: Either you're hallucinating or the supernatural is real. The fun consists in pretending that you really are on the horns of that dilemma. It's just like a magic show in that regard. There are no "weird sights" at the beginning of your adventure (or there weren't any until WDI began farting around with ghost horses and Tim Burtonesque pet tombstones). At least as it was originally designed, you see a perfectly normal-looking house. There's a small family plot in the corner of the yard. Some of the epitaphs indulge in a bit of boot-hill humor, but so what? That's no big deal. You enter the foyer, and again, there is absolutely nothing peculiar to be seen. (As usual we are at Disneyland; we'll deal with Orlando presently.) The foyer is certainly old-fashioned, what with those candles for lighting, but after all it is an old house. The first unnatural elements you encounter are aural: the organ dirge and the Ghost Host's voice. He talks about inexplicable things like creaking hinges when there's no door around and flickering candles when the air is utterly still, but you're not actually seeing or hearing those things. So far it's just the organ and him, and "eerie sounds" like that have a tough time earning the "inexplicable" rating all by themselves. It's too easy to imagine an organ in the next room, and some sneaky guy speaking through the curtains, or something like that. 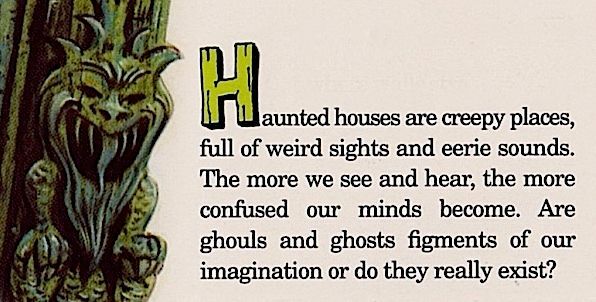 Granted, the sounds make it a "creepy place," but so far our minds have not "become confused." It's in the portrait gallery that your eyes first see weird sights to complement the eerie sounds. Soon the room will elongate and the Ghost Host will offer the explicit challenge: real or imagined? But that in fact is not the first weird sight. 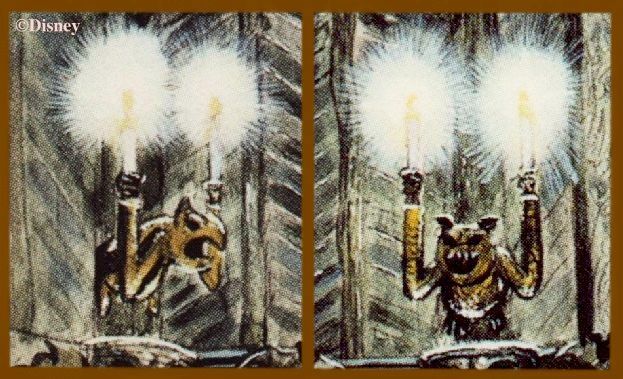 That honor goes to the gargoyle candle sconces. 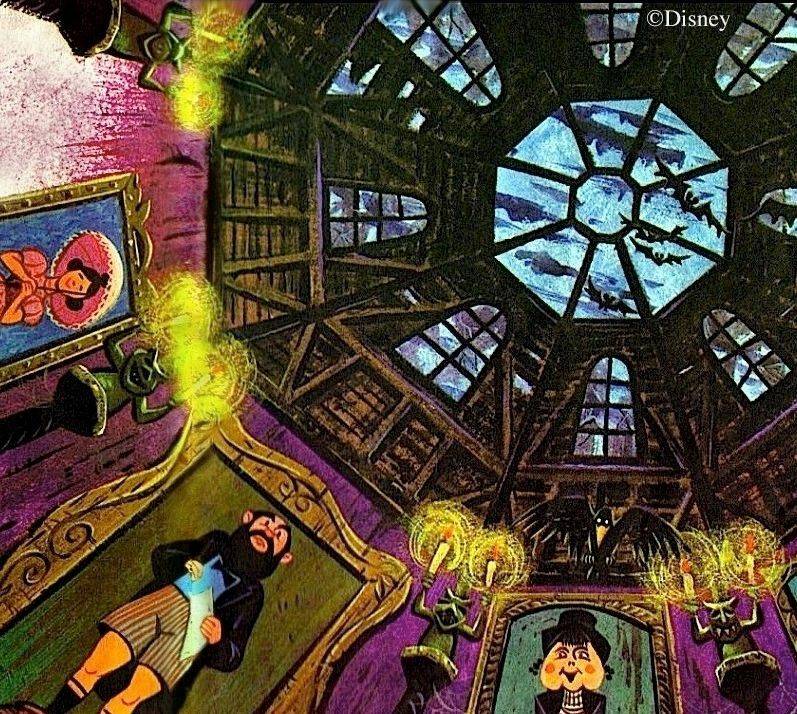 I first rode the Haunted Mansion when I was 14, during opening week. (That story is HERE.) Luckily, I had no idea what to expect, so everything was a fresh surprise. Looking back, it intrigues me that certain things from that first visit made a particularly vivid impression and stand out clearly in my memory. One of them is the experience of walking into the stretching gallery and seeing these handsome devils perched overhead. More specifically, I remember them as dark silhouettes, which is what you're more apt to see until you're well inside and getting used to the lighting and the shape of the room. 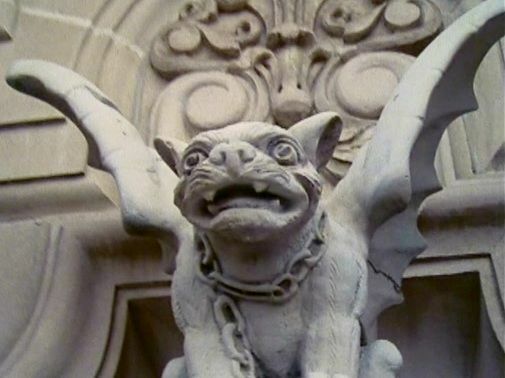 I think the reason the gargoyles made such a strong first impression is that they really are the first things you see in the architecture of the place that are so far out of the ordinary that they beg for an explanation—which you are not prepared to give. In an instant you have gone from visiting a perfectly ordinary Victorian house that sounds like it has ghosts in it to a house which is itself from the outer reaches of Victorian eccentricity. Seems to me that is a big, big difference. Here we have a ring of grotesque creatures glaring down at anyone who enters the art gallery. What sort of gentleman would inflict something like that on his guests? What kind of house is this, anyway? You're about to find out, of course. It would be nice if I could claim that this was all planned, that the Imagineers intended the gargoyles for this icebreaking role from the start, but alas, it isn't so. Originally, the weird sights were going to begin immediately in the foyer. 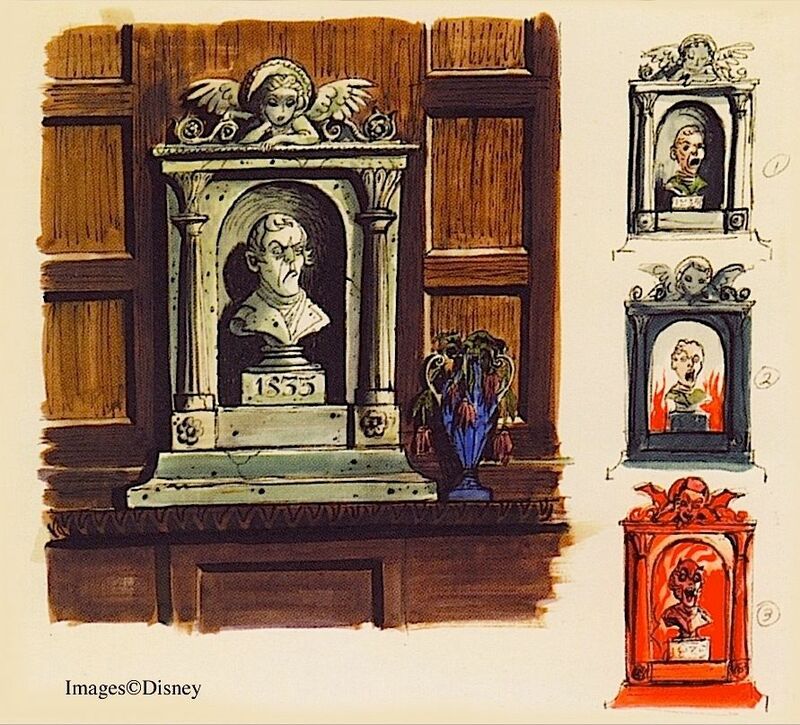 By 1964 (or the beginning of '65 at the very latest), they were working with the concept of a talking bust on the wall that transformed dramatically before your wondering eyes. Vestiges of this idea still remained, apparently, in the 1968 show script that served as the basis of the "Story and Song" narrative. Mike hears the voice of the Ghost Host coming from a marble statue in the entry hall. This was before they decided to make the Ghost Host a disembodied voice. For a time they were going to make the talking raven your host, and he was going to make his first appearance in the foyer, perched in the corner. 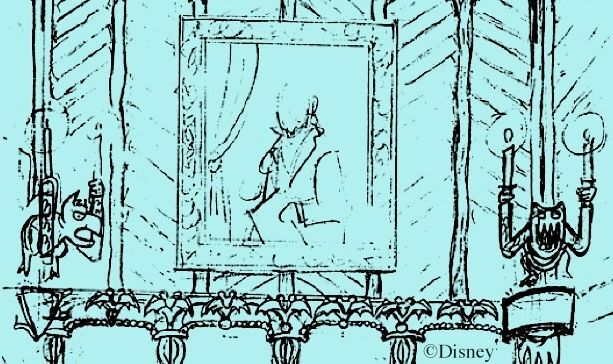 This is still indicated on an effects blueprint from early in 1969.
with a changing portrait, while Phantom Manor has a ghostly mirror. So it is only at the Anaheim original that the gargoyles serve as your escorts to the edge of the vortex, encouraging you to think, "This house itself is weird" before you think, "This house is impossible." They inherited this role by default, it seems. Mayhap this explains why they were redesigned? Because they were, you see. Redesigned. 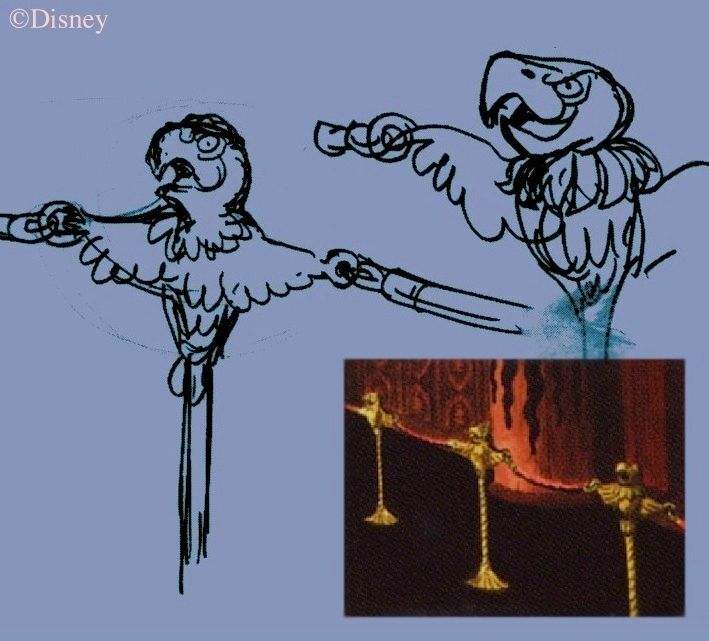 According to Marc Davis's artwork, they were originally going to be gryphons, or at least gryphonish creatures, with bird-like heads. Notice that they're staring straight ahead. These sconces were remodeled so that they had more bat-like faces, with more prominent eyes, and most importantly, they were made to bend over so that they were looking right at you the guests. The psychological difference between a statue that stares off into space and one that is obviously looking right at you is considerable, no? unambiguously birds, gazing inward toward whomever might be in the center of the hallway. faces so as to be looking directly at any guests who might be standing directly next to them. 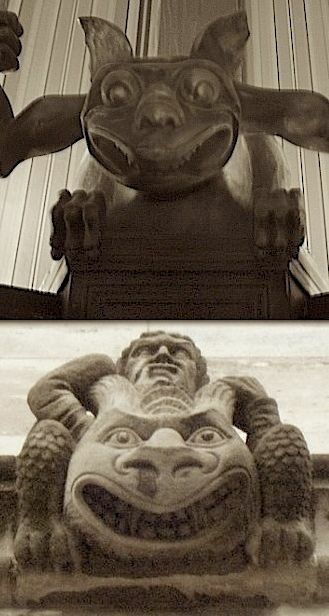 So to return to our earlier question, do you suppose the gargoyles were made to "wear a human face" and stare right at you because the important role of first weird thing you see had fallen to them after the foyer had lost that assignment? Hmm. It would be nice to know the sequence of events more certainly, but there are a few clues suggesting that the makeover did indeed take place very late in the game. 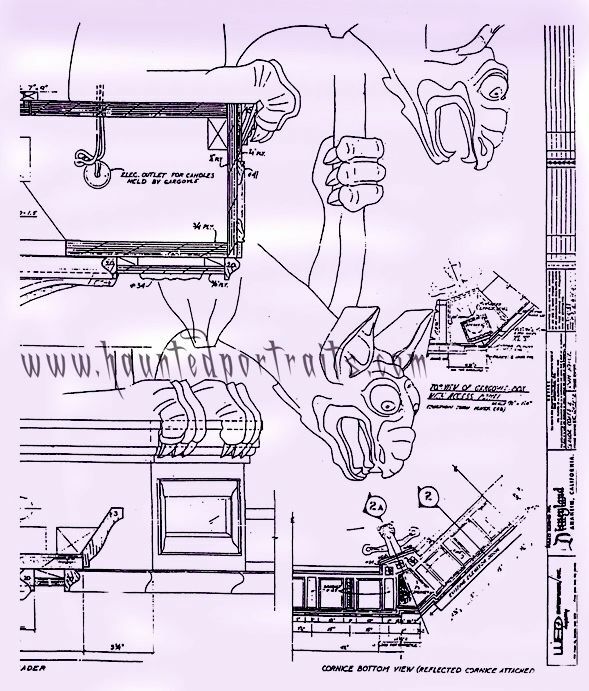 First of all, the date on that gargoyle blueprint, though admittedly hard to read, looks to me like "5-6-69," which is just three months before opening. If that's the original blueprint for the figure and not a second, revised blueprint, then it proves that the redesign took place quite late. 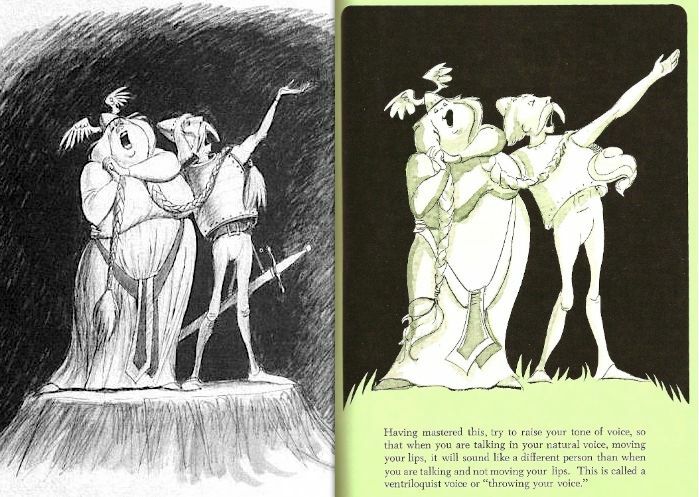 In the book, the text and illustration for "The Crying Griffon" trick obviously speaks of and shows us the sconce from Davis's artwork rather than the battish fellow we know from the actual ride. There aren't any other anachronisms in the artwork that I can see. Was the final design of the figure still in flux when this booklet was in the works? 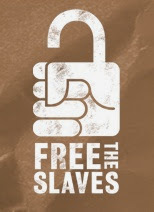 Another clue comes from the "Story and Song" narrative, based, you will recall, on a 1968 script. 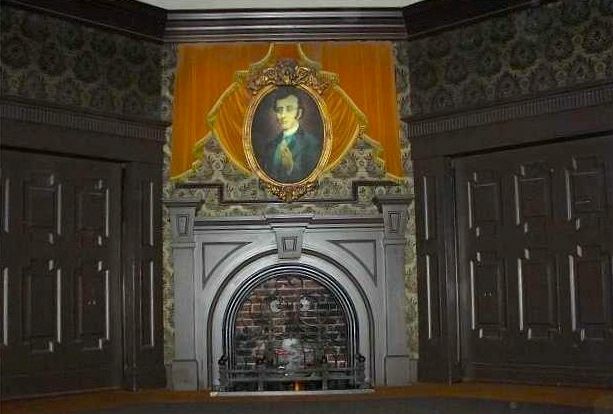 The stretching gallery is described in some detail, including the portraits, the stretching, the lack of doors and windows, and the hanging corpse, but there's no mention of creepy candle sconces staring at Mike and Karen. Instead, we are told that there is a bookcase in the room, and that the raven perches on it and speaks ("He chose the coward's way out!") 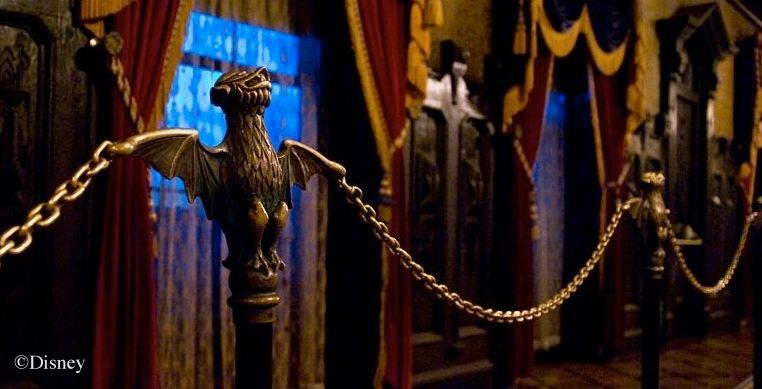 I would think that the gargoyles as we see them today would be a bit of a distraction in a scene like that, competing with the raven for attention, whereas the gryphon fixtures staring out into space would be less obtrusive. 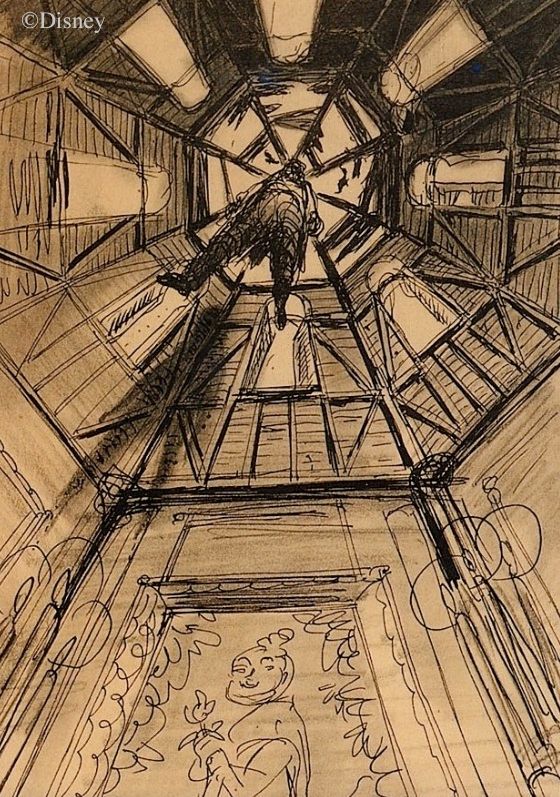 It may be that when this artwork was done neither the roof nor the gargoyles had yet been redesigned. 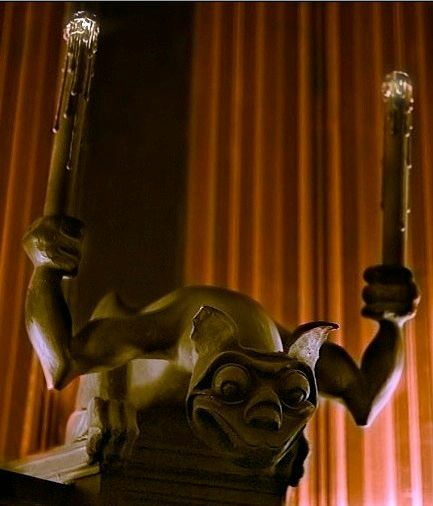 This would be further evidence that the gargoyle revamp came relatively late, possibly motivated by the realization that those little devils were bound to leave an unusually strong impression, once it became apparent that they would be the First Weird Sight. Not provable, but intriguing nonetheless. loves the gargoyles we got. And that's because they're perfect. 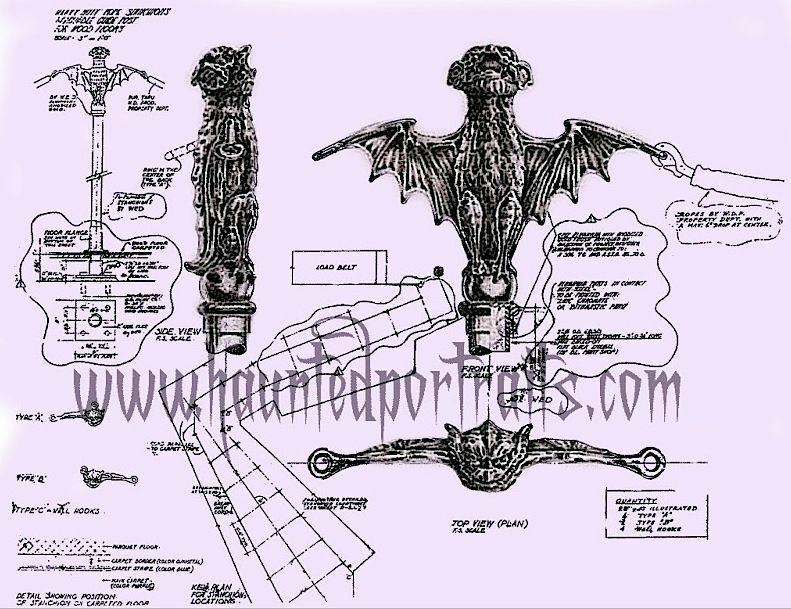 The Haunted Mansion gargoyle sconce is modeled directly after . . . sorry, I got nuthin'. 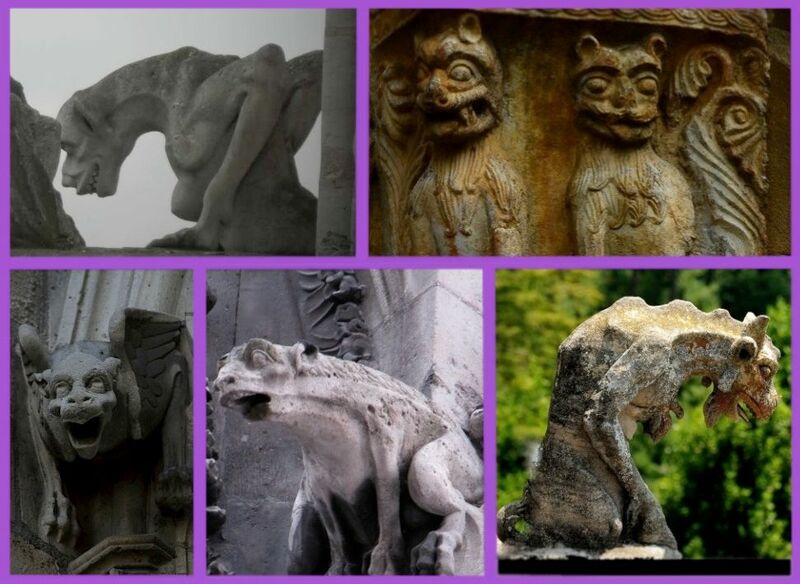 I've hunted around for an inspiration for the HM gargoyle among pictures of real gargoyles and grotesques, but I've never found anything. Of course, there's no guarantee that there is such a prototype. Still, there are plenty of figures that are reminiscent of our little monsters in one way or another. But the one that most impresses me lives on the north face of good ol' Notre Dame de Paris, home to dozens and dozens of gargoyles and grotesques. 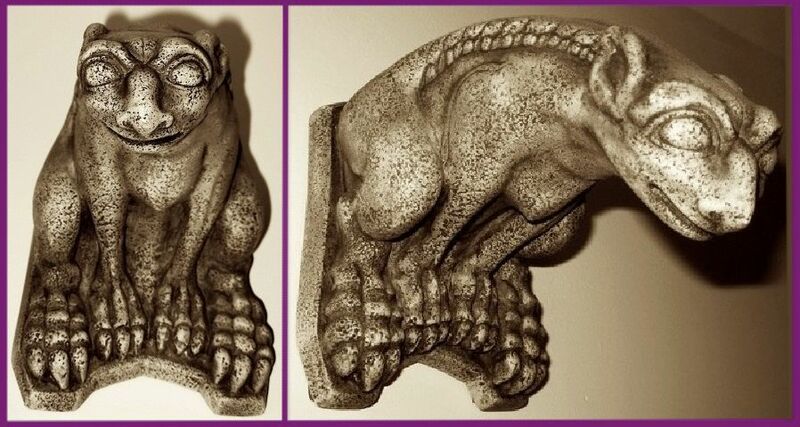 By the way, yes, I am aware that "gargoyle" technically refers to waterspouts, but I am also aware that it is used loosely for any kind of grotesque statuette, so chill, baby. At least I spelled it right. 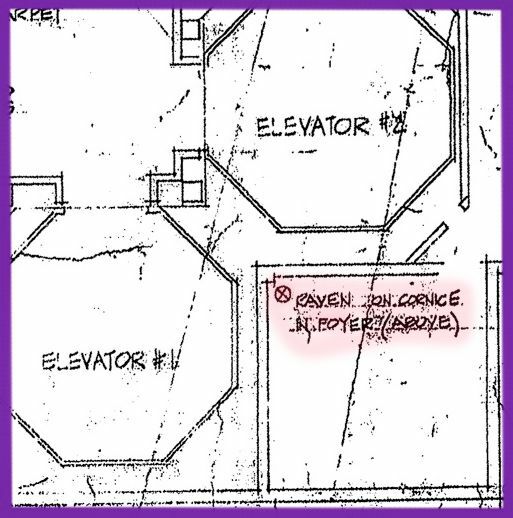 Look at that blueprint above: "GERGOYLE"? Imagineers love them some gargoyle too. You Floridian Forgottenistas already know this, but be it known to the rest of you that the Orlando gargoyles talk. 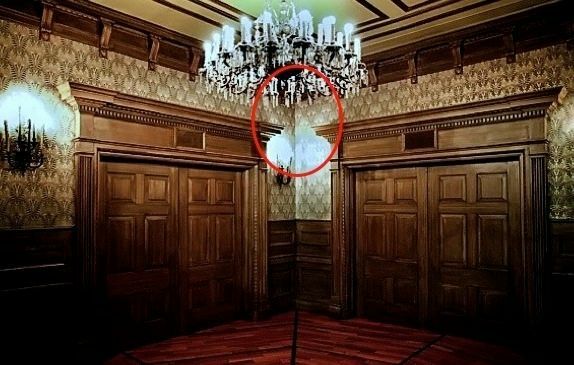 Ever since the 2007 refurb, they whisper to guests who lag behind and don't clear out of the stretchroom soon enough. Well, not that last one. But they do giggle. 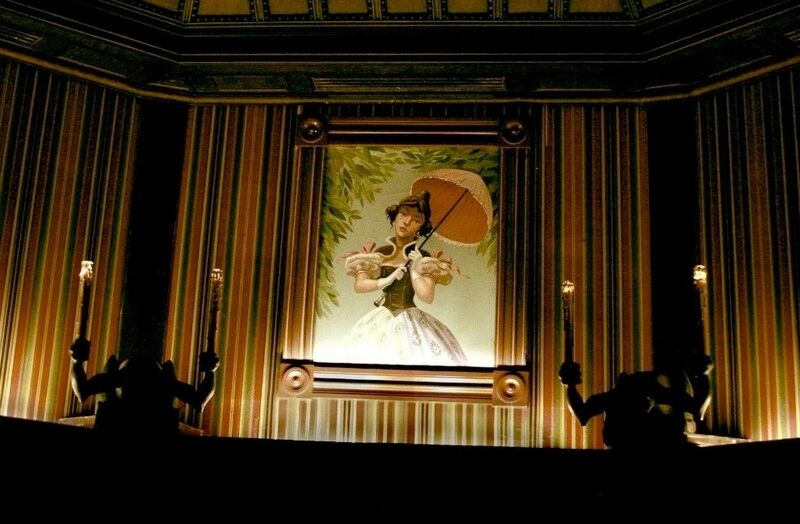 Reportedly, the Imagineers were planning to give the figures some animation too, but that didn't happen. I am inclined to think that at this point in the show flow, moving gargoyles would be too much too soon. 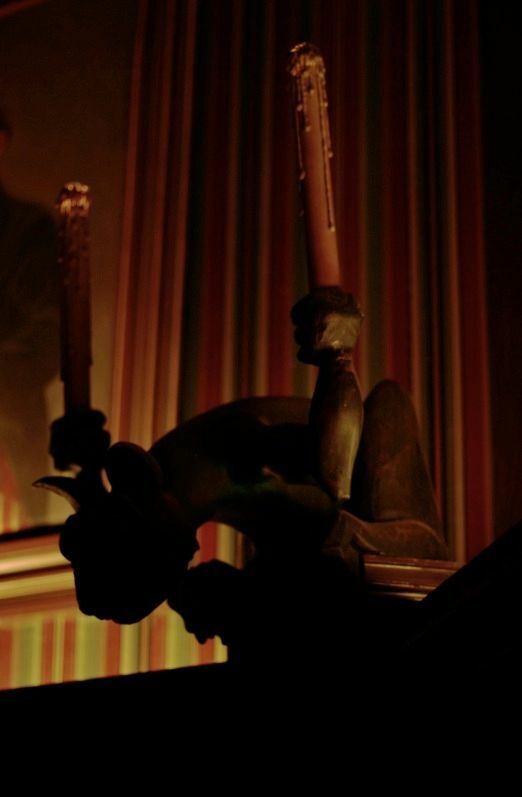 On the other hand, since the supernatural visuals have already begun in the foyer at WDW, perhaps some subtle movements by the gargoyles would have worked just fine.